Ken Loach’s Cassandra complex must be giving him grief. After four and a half decades, the director is still rallying against social inequality, placing that theme front and centre in a majority of his work. 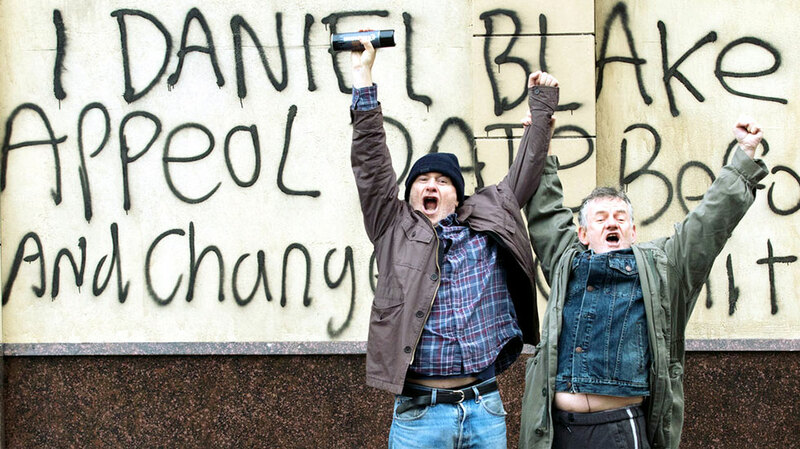 If I, Daniel Blake is a metric, then the situation has certainly not improved, and the director’s fight is far from over. The story follows Daniel Blake (Dave Johns), a middle aged carpenter recovering from a serious medical condition. Under medical advice not to work while recovering, Daniel seeks help from social services. What he finds is a system stacked against him, heedless of his health, and harshly punitive. Meeting with a newly relocated single mother of two (Hailey Squire), Daniel seeks to live his life with as much dignity as he can muster under the system. I, Daniel Blake is a heart wrenching film about a man caught in an insane bureaucracy. It is something straight out of the realm of Catch 22, as Blake struggles against a system set against him despite claiming to be for his benefit. Unfortunately this is the reality for many in the UK. Writer Paul Laverty (a long time collaborator with Loach) couches all this in the language of the institutions, those pleasant sounding euphemisms that surround unemployment services. All this is merely jargonism, projecting a caring persona while forcing the subject to navigate an Orwellian world. A social service version of nuspeak. That impersonal nature is further enhanced by the added filter of the internet age, an extra Herculean task required to be navigated by our technologically challenged protagonist. In this Laverty brings a sense of absurdity, bringing comedy before ramping up the sense of tragedy in the proceedings. Loach’s social realism works well with the actors, giving an authenticity to the proceedings. Each scene feels fresh and improvised rather than over-rehearsed. Hence the audience finds it very easy to relate to Dave Johns’ Daniel. He is someone we could know and respect, that has just fallen on hard times. Similarly, Hailey Squires as a mother of two trying to make ends meet, rings depressingly true. Each character is injected with warmth and humanity. Each is wonderfully engaging for viewers. Hence when things go badly, the impact is palpable. A deeply moving film, given added weight by the truth of its style and subject matter. I, Daniel Blake may at times be excruciatingly harsh viewing, but at other times it is filled with the warmth of human emotion. This gamut of emotions that the film runs makes it essential viewing.